During one year, Boston Globe reporter Tom Haines and photographer Essdras Suarez traveled to remote regions in eight countries, on four continents. Both veteran journalists, Haines and Suarez had a singular goal: to travel stark geographic and cultural divides and document the land and lives found within. Their accounts, from frozen tundra and sweltering desert, from Islamic mosques and Buddhist temples, appeared in a four-part series in the Globe during the fall of 2004. 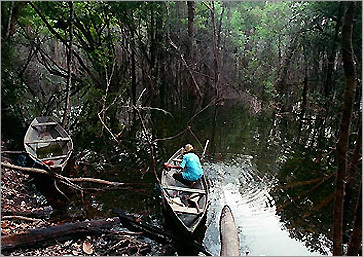 Basilio Almeida, 70, the father of 21 children, boards his canoe to fish near the village of Canauini, Brazil. Still an intersection of remote terrain and the will to live within it, the South American savanna is the first of four geographic and cultural divides the Globe will journey across this fall, in a series that will circle the planet. 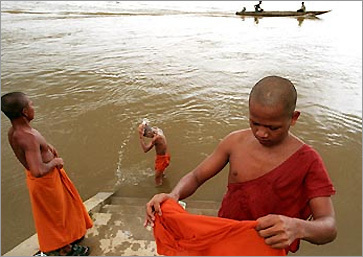 Buddhist monks bathe in the Sekong, a tributary of the Mekong, in Siempang, Cambodia. French colonialists dubbed the last of their failed efforts to navigate the Mekong and the Khone Falls' dangerous blockade ''The End of Illusions." In the century since, many living above and below the falls have witnessed the end of any illusions they may have had, not of colonial conquest, but of what to expect from life. 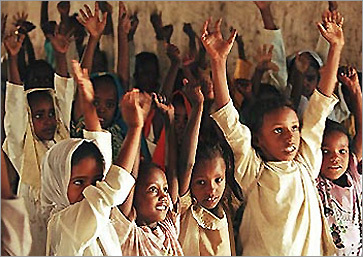 Some of the youngest pupils volunteer to answer at the school in the riverside village of el-Arish, Sudan. Over thousands of years, an expanse of rock and sand straddling Sudan and Egypt has been an inhospitable buffer between diverse communities, of Africans and Arabs, of Christians and Muslims and those with many gods. 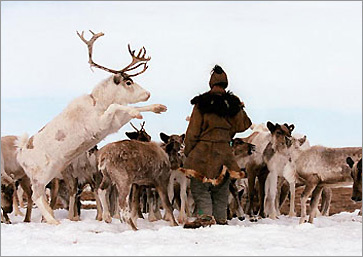 A herder offers a sodium-snack (human urine in a tin cup) to reindeer, which in turn jockey for position to get to the treat. In the 20th century, distant capitals, Moscow and Washington, split much of the Arctic into communist and capitalist lands, making a barrier of the border through the middle of the Bering Strait and changing forever how natives and newcomers on both sides live.